"All the women of the world need to be saying enough to fascism, enough to dictatorship!" Kurdish people demonstrate in Rotterdam for the liberation of Abdullah Ocalan and other political prisoners in Turkey, on January 05, 2019. Utrecht Robin/ Press Association. All rights reserved. Despite our geographies being split by thousands of miles, I'm glad that you have heard my voice. Even when we are from very different corners of the world, as women, we have always recognised each other. As Hypatia says, “none of us look like one-another, but the things that unite us are greater than the things that separate us”. We are all sisters. The thing that unites us the most is our freedom struggle, our resistance against all kinds of fascism, dictatorship and the patriarchal mentality. Women who resist and struggle, always become symbols – Clara Zetkin, Rosa Luxemburg, the Mirabal sisters, Sakine Cansiz, Leyla Qasim and many other women become symbols through their struggle. As women, we constitute half of the world’s population. Yet, we are all oppressed. When we start fighting for our rights, we are labelled as terrorists. All the women of the world need to be saying enough to fascism, enough to dictatorship! The killing of women through domestic violence, female circumcisions, child marriages, women tried with the death sentence in prisons of Iran – Zeynab Jalalian is one of them – the Kurdish women who had their mother tongue banned, the Arab women who have fled war, all point to femicide. As women, who are prepared to die, we can stop this femicide through the connection of our struggles. For as long as we are determined in our struggle. I am a Kurdish woman. My consciousness of the injustice against women developed thanks to Mr A. Öcalan. It is through the importance of the struggle Mr Öcalan placed on women’s freedom and comradeship, that millions of women have developed strong willpower. The women experienced an awakening. And I am one of these women. I learnt to be at peace with my gender, to fight against the patriarchal mind-set, and I learnt to be a feminist. By learning from Mr Öcalan that a society will only become free when the women are free, I conducted a struggle for women’s freedom for many years and I will continue to do so. Mr Öcalan, whom I owe my own awakening to, has been locked in a room in isolation for the last 20 years. To call for a removal of the isolation of Mr Öcalan, who millions of Kurds see as representing their political will, I started a hunger strike. Mr Öcalan is an important actor in the efforts for creating peace in the Middle East and the world. As a prisoner, against both national and international law, he is denied all his rights and freedoms. To ask for these rights to be recognised, we as Kurdish politicians of the Peoples’ Democratic Party (HDP) and the Democratic Society Council (DTK), called for an end of the isolation. We said such an isolation is a human rights crime. However, to silence us, theAKP (Justice and Development Party) and MHP (Nationalist Movement Party) locked many of us up in prison. They specifically targeted women. More than half the MPs imprisoned are women. The same is the case for the mayors of cities, who were put in prisons. The mentality that does not accept the quota of women in politics, implemented a policy of 60-70% quota of women in prison. I was in prison for about one year until I was released at the end of January on Day 79 of my hunger strike as a result of international solidarity and support. A prisoner has nothing but their own body. 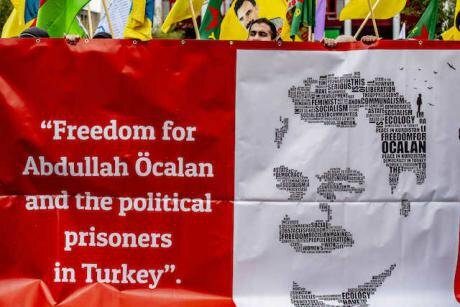 That is why I started this hunger strike and despite the state’s attempts to break my action, I will continue until my demand – the end of the isolation imposed on Mr Öcalan – is being met. To this end, I have written letters to European institutions that can hold Turkey accountable for its neglect of human rights and violation of international law. Now, along with me, in the prisons around the country, hundreds of friends, political prisoners, have started an indefinite-irreversible hunger strike. In different parts of the world, such as in front of the European Council in Strasbourg, hunger strikes are ongoing. Our health is increasingly deteriorating in the face of this global silence. Hannah Arendt once wrote something along the following lines: “Freedom means action. Because freedom can only be attained through action. Action drives the movement that resonates amongst the people”. The demands of my action are legitimate and rightful. If our demands are not met, hundreds of people can lose their lives. If this happens in the twenty-first century, it will not only be the shame of Turkey but a shame for all of humanity. For the world not to be faced with such a shame, the women of the world need to do whatever they can. And without losing any more time. We will continue to resist. Resistance will help us win. Our belief in this is infinite. In this respect – I call you all to resist. Long live the solidarity of the peoples and of women.